Nature-film buffs will have a chance to learn what it takes to film within the forces of nature and bring the story back home at this weekend's inaugural Sun Valley Film Festival. "Celebrating Wild Nature and the Power of Film," a free program sponsored by local nonprofit Wild Gift, will take place at the Sun Valley Opera House on Saturday, March 17, at 2:15 p.m. The National Geographic Channel documentary "Great Migrations: Behind the Scenes" and "The Mono Lake Story" will be screened, followed by a discussion with Ketchum-based filmmaker Bob Poole. "Great Migrations," an award-winning documentary series, takes viewers around the world on the arduous journeys that millions of animals undertake to ensure the survival of their species. Shot from land and air, in trees and cliff-blinds, on ice floes and underwater, "Great Migrations" was three years in the making and shot over all seven continents. The film's team, including Poole, traveled 67,000 kilometers to complete the series. Poole has promised to describe "the wildest thing I have ever seen in my life" during the program, which, for Poole, says a lot. Poole grew up in East Africa, where his father was the director of the Peace Corps, and later director of the African Wildlife Foundation. His family spent much of their time with the abundant wildlife that thrived there during the 1960s and 1970s. Poole's unique upbringing gave him both a lifelong appreciation of the natural world and a highly adventurous spirit. Over the last 16 years, he has traveled the world as a director of photography, documenting science, nature and adventure films for National Geographic Channel and other networks. The award-winning film "The Mono Lake Story" will also be presented. The documentary is about the power of film and its ability to spur viewers to action, in this case to save Mono Lake, which was almost drained to provide water for Los Angeles. Program sponsor Wild Gift is a nonprofit organization founded by Bob Jonas 10 years ago to support a new generation of leaders committed to creating social change in balance with the resources and gifts of the natural world. Jonas grew up in the Wood River Valley. 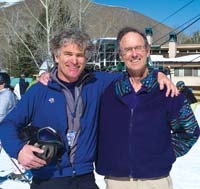 He is a former wildlife biologist and founder of Sun Valley Trekking. For 30 years, he has guided backcountry trips in Idaho and Alaska. "Bob Jonas has as profound a connection with the wilderness as anyone I have ever met," said Wild Gift Executive Director Deborah Knapp. Every year, Wild Gift recruits outstanding "social entrepreneurs" ages 21-30 to join a growing network of young leaders promoting better world projects around the world. Wild Gift received two endowments last year, from Lloyd Nelson and the Anderson Family, to continue its programs. "These were major infusions that have enabled us to move forward, from an entirely volunteer organization to a long-term sustainable nonprofit organization," Knapp said. "We are actively recruiting social entrepreneurs from the Wood River Valley." For more information go to www.wildgift.org.